The club has an active triathlon section. The Maidstone Harriers Triathlon Section is an exciting developing area for the Harriers with rapidly increasing participation and activity. Our triathletes compete at all levels, from local starter Sprint Triathlons to International Ironman competitions, and consist of athletes of all ages, ability, shapes and sizes. The club recognises the technical nature of Triathlon and takes an active role in developing its members through the organisation of courses and other regular activities run by qualified coaches, both internal and external to the club. Recent courses include beginners, masters, and open-water swimming classes, all at local venues, with swimming being the most technical discipline and the one where help is requested most often. Other activities undertaken by the club include group cycle rides, training in transition practices, and bicycle maintenance. 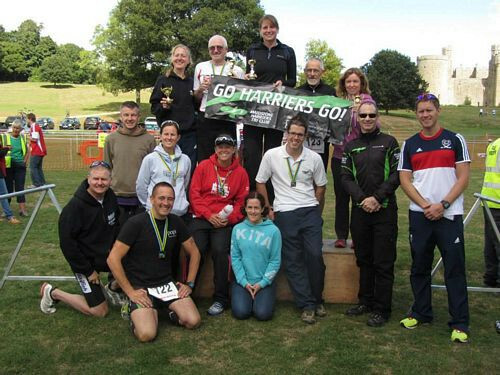 The running aspects of Triathlon are more than adequately covered by the core running activities of Maidstone Harriers. This year has seen numerous ‘firsts’ with many members completing their first triathlons, tackling open water swimming for the first time, whilst other members have taken on the ultimate Ironman distance. The Triathlon section operates a closely-fought independent Club Championship consisting of many local Triathlon events using a ‘per-category’ system with extra points for personal best performances. Members have enjoyed significant successes at local events in recent times and regularly pick up pieces of ‘silverware’ with podium finishes! Finally, the Triathlon section operates an open and friendly policy and invites any interested people to come and meet the current Harrier members at the regular Wednesday club nights.